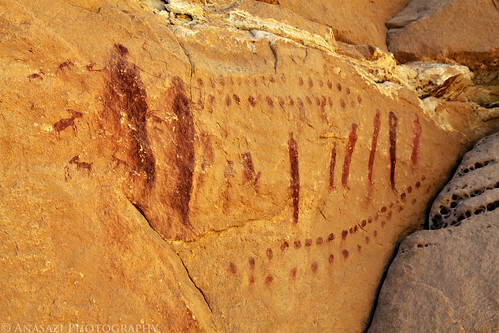 While exploring the San Rafael Swell last month, I came across this small but very detailed pictograph panel. It’s not the best preserved site I have ever been to, but there’s still enough detail here to see what’s going on. The figure on the left has it’s arms outstretched just like the main figure in the Ascending Sheep Panel. Looking closer, this figure might even have the same bighorn sheep head and snake tongue, too? The next figure on the right appears to be playing a flute and there seems to be a very skinny snake above them both. What a very cool site! When I arrived at this site it was in direct sunlight and didn’t photograph very well, but I liked this panel so much that I hung around for about an hour until the panel was completely in the shade. I’m glad I did because my photos turned out much better.